This majestic Japanese Sago Palm or King Sago is the most widely cultivated of the cycads. 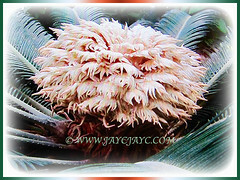 This tropical plant is not a palm but truly a very attractive and ornamental cycad. Besides, it is one of several species used for the production of sago. Botanical Name: Cycas revoluta (syn. 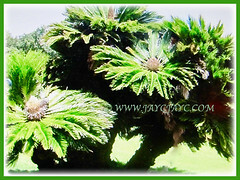 : Cycas miquelii, Cycas sexseminifera). 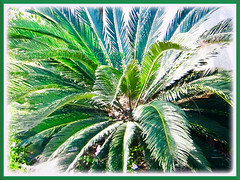 Common Name: Japanese Sago Palm, King Sago, Sago Cycad, Sago Palm. Etymology: The specific epithet revoluta is from Latin revolutus meaning curled back, in reference to the revolute or curled back nature of the leaflets. Origin: Native to southern Japan including the Ryukyu Islands. 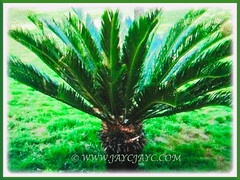 Plant type: An ornamental, evergreen and perennial cycad. 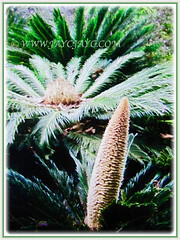 Features: Cycas revoluta is from the genus Cycas that consists of 113 accepted species of flowering plants. It is a slow-growing and low-growing, palm-like evergreen perennial growing up to 2 m tall and spread as wide. The thick and stout woody trunk that is typically about 20 cm in diameter can sometimes produce multiple heads of leaves. This very symmetrical plant supports a crown of large, leathery, dark green and arching pinnate leaves up to 1.5 m in long in a terminal feather-like rosette to 1 m in diameter. The crowded, stiff and narrow leaflets are 8-18 cm long and have strongly recurved or revolute edges and tomentose ovules. The basal leaflets become more like spines. 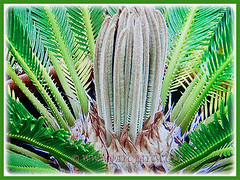 The petiole or stems of this Sago Cycad are 6-10 cm long and have small protective barbs. It is dioecious with the male bearing pollen in cone-like inflorescences and the female bearing groups of megasporophylls. Pollination can be done naturally by insects or artificially. The golden-brown and ovoid inflorescences are rarely seen except on mature plants. The pruinose, sarcotestal and ovoid seeds are 25 mm long and 20 mm wide. Roots are called coralloid with an Anabaena symbiosis allowing nitrogen fixation. 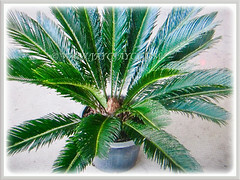 Culture (Care): Cycas revoluta or Japanese Sago Palm can be grown easily with least maintenance. Moisture: Medium water requirement. It is fairly drought-tolerant once established. Excessive watering can lead to root rot and yellowing of leaves. Soil: Humus-enriched, loamy and well-drained soils. It requires good drainage, otherwise it will rot. Others: This majestic cycad does not require any pruning. Nevertheless, trim off yellow, withered or dead leaves once monthly to keep it tidy and aesthetically pleasing. Do take note that all parts of the plant are toxic to animals including humans if ingested. 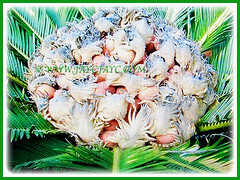 Once annually, feed the Japanese Sago Palm with a slow release fertiliser like Osmocote for optimum growth. Alternatively, use a balanced 10-10-10 slow release fertiliser. Generally, free from serious diseases and pests. However, watch out for Aulacaspis yasumatsui which is a scale insect feeding on Cycas revoluta, and if unchecked is able to destroy the plant. Also, it can be infested with glasshouse red spider mites and mealybugs. For subtropical and temperate regions: Hardiness: USDA Zone 8b-11. 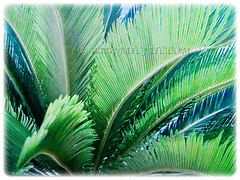 Cycas revoluta or Japanese Sago Palm is one of the most widely cultivated cycads, grown outdoors in warm temperate and subtropicalwarm temperate regions or under glass in colder areas. It is tolerant of mild to somewhat cold temperatures provided the ground is dry. Propagation: Easily propagated from seeds that’ll take several months to germinate. A better and quicker method is by removal of basal offsets and plant them in their own individual pots. 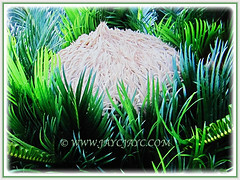 Usage: Cycas revoluta or King Sago will be excellent as a landscape plant in parks, gardens or along highway median strips. Ideal too for container gardening. It is quite popular as a bonsai plant to beautify the interior of one’s home. The pith of Cycas revoluta contains edible starch and is used for making sago.